Creative outlets – performance and visual – are threads that sew together bonds between people and their community. There is no age limitation, restrictions on health, thought or level of experience that can hold someone back from creating. With practice, patience and the right tools, we can develop skills to apply to our own art. Even if you do not wish to physically create your own, appreciating the art of those around you and supporting art in your community are equally important. 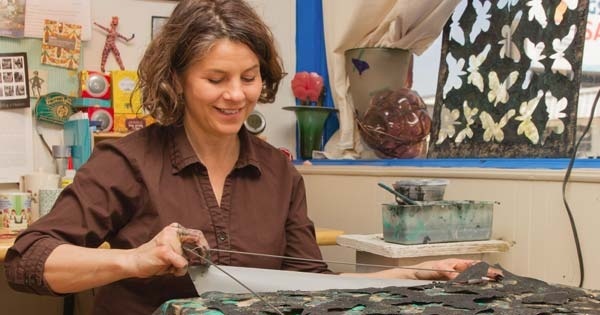 Appreciating the arts – the process and the product – is vital to the survival and growth of any creative endeavor and one reason ArtFest was founded. We invited local artist and educator, Leesa Haapapuro, to be our Featured Artist in our inaugural year alongside over 70 other local artists, creative organizations, and performers. Sunday, September 18th you can meet Leesa and help her on a collaboration project at Community Park in Beavercreek. ArtFest is free to attend from 11 am- 5 pm with free parking at Nutter Park on Factory Road. All ages will enjoy the activities, food trucks and local buys. Proceeds from the event help fund community art projects and lessons provided by Infusion Art Endowment in conjunction with Greene Giving a 501c3. To dig in, I asked Leesa for her input on how she started in the creative field and what moved her to stay in Dayton. TG. When did you know that art – or the act of creating – was your calling? LH. Making art was all I ever wanted to do, my Mom let me draw all over my bedroom walls when I was young. I applied to Interlochen Arts Academy, a boarding school in northern Michigan, and got a scholarship to go there for high school, that decided my future. TG. Your personal works are made with a spectrum of media…I appreciate it because of the significance each medium gives to the subject of your work. If you were only able to work with one, which would it be and what would you create? LH. I guess if I absolutely had to choose, it would be clay, so I could continue my portrait project which I started 10 years ago. Lately I've been sculpting small portraits of my students’ faces. TG. With any growing city, the arts play an important role to bring communities together, cultivate culture and to educate the citizens. Dayton has been experiencing this along with the surrounding suburbs. Since your time in Dayton, what is your perspective on this growth in our great city? LH. The Dayton Visual Arts Center had just formed when I came to Dayton, I decided to stay when I became their first artist in residence (at the gorgeous Biltmore building!) I’ve always loved their motto: Art for the community and a community for artists. Jerri Stanard started up K12 Gallery for Young People, and gave me my first teaching job, as well as the feeling that I was able to contribute to the larger community by working with disadvantaged youth. I was encouraged when Culture Works awarded me an individual artist grant, and loved being involved with R.E.A.C.H. Across Dayton, for my first community art project, the Heritage Sculpture Project in Courthouse Square, with Tess Little, Bing Davis and Paula Recko. Those people and organizations continue to inspire me, and the arts continue to play a vital role in this city. Creative endeavors have a home in Greater Dayton and you can find many resources and experiences at ArtFest to enjoy and appreciate. If you would like to be involved, check out infusion-art.org/artfest for more information.